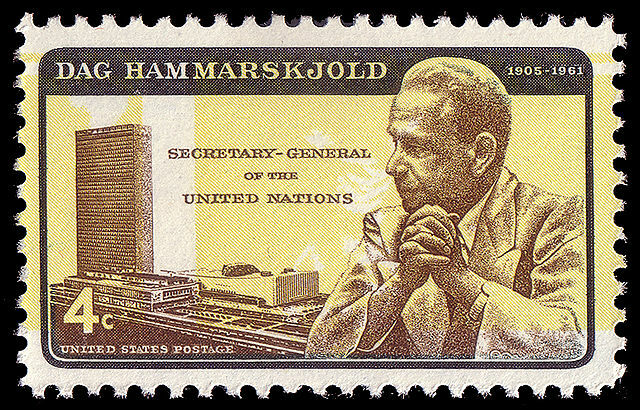 Dag Hammarskjold was the second Secretary-General of the United Nations, serving from the spring of 1953 until his death — in a plane crash on the way to facilitate cease-fire negotiations in the Congo — in September of 1961. His legacy is, by and large, a very well-regarded one, and he’s been honored many times since his untimely passing. He’s one of three posthumous recipients of the Nobel Prize (in his case, the Nobel Peace Prize), for example, having been awarded the honor that same year. But the most notable honor Hammarskjold received may be a stamp. Not because of the Secretary-General’s work, but because of the Postmaster General’s decision once the world realized that a mistake had been made. The image above shows the stamp as issued. It contains something which philatelists call an invert error — part of the stamp is printed upside down. In this case, the error is subtle to lay people because the inverted part is the yellow background, and the resulting visual cues are just a handful of vaguely out of place white splotches. (This is what the corrected version looks like.) Other famous inverts, such as the Inverted Jenny, seen here, are much more obvious. And like any other collectable, errors are often very valuable. The Inverted Jenny, for example, has a face value of 24 cents but an estimated value as a collectable approaching $1 million. But the error itself isn’t what causes a stamp to become so extraordinarily valuable. Rather, it’s the efforts of the issuing body to fix that mistake, which typically involves ceasing production of the faulty stamp. In the case of the Inverted Jenny, the U.S. Postal Service printed only a handful of the errors. Only 100 such stamps are known to have ever existed. His decision was controversial in the world of stamp collecting and even led to litigation. One of the earliest owners of a sheet of Dag Hammarskjold inverts sought a court order to prevent Day’s plan from continuing forward — and succeeded in those efforts. But by the time the court ruled, the damage to the collectable nature of the inverts was long gone. The Postal Service printed roughly 160 million total Dag Hammarskjold stamps, of which 40 million — approximately a quarter — have the error. The inverts are worth only about 50 cents each. Bonus Fact: As noted above, Hammarskjold is one of only three Nobel winners to receive the award posthumously. One of the reasons there are so few in that category is because the Prize committee disallowed such awards from 1974 onward. There is one exception, though. On October 3, 2011, the committee awarded half of the Nobel Prize in Medicine to Canadian immunologist Ralph Steinman, but unbeknownst to the awarding body, Steinman passed away three days earlier. The committee did not reverse their decision. From the Archives: Foul Tip: The story behind one of the most famous baseball error cards, ever. Warning: contains a four-letter word. Related: The stamps in question.